As is generally the case with compilation discs, this is sort of a mixed bag of tricks. For my money the Hounds of Love material steals the show, but there are some other standouts. I would say that this set would make a good introduction to the various periods of Kate Bush’s career. But can’t you say that about most collections like this? The music here is pretty and rather delicate, but Bush’s voice is angular and waif-like. It makes for an intriguing contrast. It turns more rock oriented as the rhythm section joins later and they really take it to new levels. There are several changes and alterations along this course. There are some rather Yesish moments in the music later and Bush’s voice purely soars at times. For my money Hounds of Love was the album that Kate Bush was building up to and it was the peak of her musical output. This track is one of the highlights of that album. That said, the whole disc is so nearly perfect that it means everything on it is incredible. There is a delicate and yet powerful symphonic nature to the track. There’s a sense of mystery and majesty there, too. It feels almost dangerous and yet it draws you in with its charms. This is a real work of musical art and one of the highlights of this set. As is the case in a lot of Bush’s music it builds up gradually and becomes something that’s far more than its origins. Of course, in this instance the humble beginnings are beyond the pale of some of the other music here. There’s a much more classical texture to this. It has an almost musical theater feeling to it, but more along the lines of operatic theater. I wouldn’t consider this to be as strong as the Hounds of Love material, but it’s a great piece of music nonetheless. If you take the dramatic musical theater elements from the last cut and raise them up to a much higher point of power you’ll have the idea of this track. It’s definitely a highlight of the set and is very enchanting and inspiring. There’s a cool drop back to ambient space and then it powers out into some rather Pink Floyd-like harder edged rock. 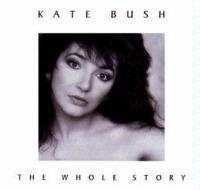 Combine the more playful side of Kate Bush’s music with a rather Beatles-like symphonic nature and then throw in some of that theatric element and you’ll have a good idea of what this song is like. As you might guess since this is the title track to Hounds of Love, I am crazy about this song. There’s a sense of fear to this, but also a sense of hope. It’s got a powered up symphonic meets rock approach. Perhaps it’s not as strong as “Cloudbusting,” but it’s very formidable. The multilayered vocal arrangement brings a lot to the table on this. Here’s another from Hounds of Love and despite the fact that this was a single, it’s also one of the strongest pieces of music here. You might hear some Peter Gabriel type sounds to this, but it’s all Kate Bush, really. I’ve always found this to be a very inspirational and powerful track. It’s also one of the highlights of the set. There are some extremely dramatic sections here and there are times when I’m again reminded a bit of Pink Floyd. Here’s another that’s gentle and playful. This is a bit too theatrical and “odd” for my tastes. That doesn’t mean it’s a bad piece, but it doesn’t hold up to some of the other music on this set. With more of a percussive, rocking nature this dramatic and oddly operatic at times. While I wouldn’t consider it one of my favorites here, it’s pretty intriguing nonetheless. This starts off very classical in nature, but then a bass begins to hint at a rock side to come. As they build on this it’s tentative with a motif that at times makes me think of Pink Floyd. There are some nice retro musical elements here amidst this arrangement. The experiment in the title refers to a military project to create a musical sound that will kill at a distance. This is very similar in lyrical concept to the book The Time of the Hawklords – at least in that conception. It is quite an intriguing and unusual composition and one of the highlights of the set. This percussive based dittie is very much in an Australian type musical motif. While I can appreciate the art involved in this, it doesn’t really do much for me. Here’s a bouncy little rocker that seems to me to be about a couple doing role playing to add some new magic to an old relationship. It’s a great way to end the set. While not a total killer it’s a great tune.